This is the thirty-first in a series of posts about war tax resistance as it was reported in back issues of Gospel Herald , journal of the (Old) Mennonite Church. So if you remember from our last episode, the board of the Mennonite Church was dragging its feet about supporting employees who did not want war taxes withheld from their paychecks. Then the whole Church, in its General Assembly, forced their hand by voting to honor the requests of such employees. After several years of study and discussion, the Mennonite Church General Board brought the military tax question to a vote — and tabled it. Normal 89 attenders will recall that a majority of General Assembly delegates voted to “support” the efforts of church board employees who do not wish their taxes deducted so that they can deal with the government in regard to military taxes. The issue came back to the General Board as such issues will and it was given extended attention at the spring meeting which convened at Kalona (Iowa) Mennonite Church, Apr. 5–7 . An early straw vote strongly favored going ahead, but when decision time came, a majority voted to table the motion. As presented, the motion called for agreeing “in principle” to honor requests of employees who ask that their income tax not be withheld. However, such approval was intended to be reviewed in the 1991 session of the board after a congregational study process which is now being initiated. No taxes were to be withheld prior to April 1991 . Motion to table, it was suggested, was related to the pending congregational study process. The board was concerned not to prejudice the case before the study process. Also there was concern that the possible consequences of such withholding be better understood. What action might the government take toward board officers? Ray Gingerich talks about tax resistance during the small-group discussion time. Wilma Gingerich (left) and Leanna Rhodes share their experiences in refusing to pay the military portion of their taxes. Some 30 people met at Goshen College, May 11–12 , for a “Consultation on Military Tax Withholding.” The military tax question has been on Mennonite Church agenda since 1977 , General Board executive secretary James Lapp told the group. But now it has become focused on the issue of “tax withholding” by church agencies for people who wish to deal with the Internal Revenue Service on their own. Avowed purpose of the consultation was to introduce a study guide, “As Conscience and the Church Shall Lead,” being prepared for use in congregations. To this end Marlene Kropf of Mennonite Board of Congregational Ministries led the group in an educational experience. David Weaver, a teacher at Central Christian High School, grew up in a family that eschewed political involvement. But in 1984 he went on a student tour to the Middle East and spent some time on the West Bank of the Jordan River, the home of persecuted Palestinians. Then, in 1986 , he wrote a paper on the issue of war taxes and in the same year he went to Nicaragua with Witness for Peace. “I saw the Nicaraguan people and looked into their eyes,” he said. That year he decided to withhold 55 percent of his income taxes. Among the leaders present was Paul Gingrich, president of Mennonite Board of Missions. He acknowledged that MBM first faced this issue as long ago as 1984 , when John and Sandra Drescher-Lehman asked that their taxes not be withheld. The MBM board of directors is divided. Some threaten to resign either way. No clear-cut answer to Gingrich came out of the consultation. But from small-group settings a cautious consensus emerged. Most groups encouraged church agencies to respect the consciences of persons who do not wish their taxes deducted by the agency, even though such honoring would involve the agency in illegal action. Several groups pointed out, however, that there are ways for persons to gain access to enough tax money to make a symbolic protest without implicating their agency in illegal action. It was urged that they explore these first. Although I have not been involved in the issue, I believe the issue of military tax deductions of church employees has been around for at least a decade. I am concerned about the continued reluctance of General Board to implement the will of General Assembly to support church board employees who as a matter of conscience do not wish to have their taxes deducted. Discussion of visions is fine, but no vision is more catching than one demonstrated through faithful action. My sympathies are with the General Board employees who have patiently gone through the lengthy process required to have their concerns embraced by General Assembly, only to have the issue kicked back into a “study process” by General Board. Why is it so hard to get to the bottom of the war tax question? The issue of paying military taxes has been knocking about in the Mennonite Church for close to a generation. At the “Consultation on Military Tax Withholding” (Goshen College, May 11–12 ) it was reported that John Howard Yoder was writing about this already in the 1950s . Perhaps these writings were not published. The earliest material on this subject which I could find in the Gospel Herald was “Dare We Pay Taxes for War?” by John Drescher ( Oct. 10, 1967 ). I found this editorial with help from Swartley and Dyck’s Annotated Bibliography of Mennonite Writings on War and Peace: 1930–1980 (Herald Press, 1987 ). This book has 16 pages on the topic “War Tax Resistance,” so the subject has clearly been one of concern among us. Some of the references go back into the ’50s , but not in the Gospel Herald . Drescher’s editorial indicates that concern about the issue arose during Mennonite General Conference and that “delegates asked for direction on the matter of paying taxes designated for war purposes.” A resolution was passed calling for “a fresh study of the biblical teaching”! Has anything changed among us in 23 years? So there it is. If Paul wrote to the Romans that they should pay their taxes, why do modern Mennonites sit around debating whether they may pay the military part of their taxes? We are known as people of the Bible. Isn’t the Bible plain enough? Not so fast. At Goshen, Willard Swartley presented a 12-point outline entitled “Method for Bible Study.” The first three points were entitled “Observation: What does the Bible say?” The second five he captioned “Meaning: What is the text saying?’ The final four he called “Significance: What says the text?” Beyond these I think the most important thing he said was that Romans 13:1–7 should be interpreted as part of a longer unit in the letter (certainly a basic Bible study principle) and that probably there was a local controversy in Rome over the payment of specific taxes. Paul’s counsel to the Romans was to pay these specific taxes and was not intended as a general principle, regarding all taxes in all times and all places. Willard pointed out that the New Testament has a number of normative texts on this subject. He mentioned the following: Colossians 2:15; Ephesians 1:19–23; 3:10; 1 Peter 3:22; 1 Corinthians 15:24–26; Romans 8:35–39; Ephesians 6:12–20. Romans 13, he said, should be interpreted in dialogue with this longer stream of texts. In the end, said Willard, there is “ambiguity in the biblical tradition over the place of authorities: respect for their responsibility for order versus awareness that they represent evil.” In other words, by simply paying taxes without thinking, we may be selling out. So it is important that we not give up just because we come with different perspectives on the issue. It is urgent that those with different points of view listen to each other under God and under the Scriptures. We have no other place to go. In response to your editorial, “Why is it so Hard to Get to the Bottom of the War-Tax Question?”… and the news article piece on the war-tax consultation in the same issue, let me note the following: Why is it that the Mennonite Church can so easily reach clarity that homosexuality is a sin and ban any dialogue whatsoever with gay members of our community but yet find the war-tax issue “contains a complex set of issues” and that it is “filled with ambiguities”? Why must we accept pluralism and ambiguity on this issue when we can so easily reach apparent consensus on the gay question? Is this not rather self-serving and hypocritical, for on the one hand our church fathers tell us we must accept differing biblical interpretations, pluralism, and ambiguity on war taxes but somehow the gay issue is crystal clear! It seems to me that there is no ambiguity, for as you note, Romans 13 is not intended as a general principle that we must pay all taxes to government. Further the whole text seems to make clear that we must clarify our loyalties and choose whom we serve, God or Caesar. Further it seems clear that if we follow the way of peace, we can have no part in allowing our money to pay for killing and war. If there is room for ambiguity I think it is more apparent on the gay question. On war taxes it seems clear. Perhaps our leaders wish to keep it plural, for only a minority can support our historic peace witness these days, while they know that pluralism is unacceptable for the gay question given the majority in our community who are convinced that homosexuality is sin. Wake up, leaders, and be fair! You can’t have it both ways. Either we seek clear standards and follow them or we become Unitarians or Quakers, where everything is ambiguous. I urge all of those conservative Mennonites who usually remain silent to “send the General Board a message” — mainly, not to be tempted into politicking with the liberal pacifist elements, and to remain within the boundaries of biblical nonresistance. If there are those who want to withhold taxes, let them do it without having the actions of the General Board as a shield. “Why Is It So Hard to Get to the Bottom of the War Tax Question?”… Maybe because there is no bottom — only a bottomless chasm between two irreconcilable views. In my own imagination I see the story told in Matthew 22 in modem “dress.” The Pharisee digs through the pockets of his custom-tailored suit. From a jumble of temple contribution receipts and credit cards (Pharisee-controlled banks) he produces a $50 bill. Again, we know that Caesar does not divide his tax collections between two baskets labeled “war” and “peace.” It all goes into one basket, and then is divided out as Caesar wishes. And so, if 50 percent (or whatever) goes for “war,” then 50 percent of anything that an individual deposits into the basket goes for “war.” The persons who pay 50 percent of their taxes are in fact paying half of their “war” tax and half of their “peace” tax. I admire those who for conscience’ sake voluntarily live at the “poverty” line so that they do not owe the tax that they object to paying. They have adjusted their lifestyle to put their (lack of) money where their “mouth” is. I’m not willing to do that — a character flaw, perhaps, but one that I seem to share with many others. Is it wrong to want to share in at least part of the standard USA lifestyle without paying for Caesar’s expenses in maintaining conditions that promote this lifestyle? Do we want a “free lunch”? And, of course, Caesar’s money can do God’s work, or so we are told by those responsible for keeping church agencies and institutions in the black. Those who have the spirit of generosity also need something to be generous with. And Caesar pays a part of the gift. If we deal in portraits of deceased generals and presidents, what do we owe to those who occupy their offices today? Over a number of years I have read articles, pro and con, on the war-tax issue. Your May 29 editorial on the same subject has rekindled my interest. A large percentage of the arguments have been of a theological or theoretical nature. However, I have not seen the following point of view mentioned. Many of us in the Mennonite Church are no longer independent farmers and/or businessmen or self-employed. (At age 48 I have witnessed this transition.) Therefore, we have little or no control over the deductions from our pay checks. No company, business, or public institution that I know of would seriously consider a request not to withhold a certain percent of taxes due. Some firms that are operated by Christians may grant us their understanding and be sympathetic in attitude, but simply are not willing to get into the legal and business ramifications of a tax fight with the federal government. Consequently, the war-tax issue, while perhaps valid, is to many simply a moot point lingering in a gray mist on the edge of our consciousness. Could this be why the 1989 General Assembly vote on the General Board war-tax recommendation went 142 for and 100 against? For me, if the federal government would institute a special, separate, extra-budget war tax (as done in the American Revolution, for example), that is a horse of a different color. I would try to resist in some way as my ancestors collectively did in Lancaster County, Pa., in the Revolutionary times. Having written my Indiana senators and representative on the war-tax issue, I see no change in federal tax regulations to be soon in coming. Study guide on military tax withholding from Mennonite Publishing House. Prepared at the request of Mennonite Church General Board, it is designed to facilitate discussion of the 1989 General Assembly request for “continued study of issues raised by taxation for military purposes.” It is entitled As Conscience and the Church Shall Lead . A response form is provided so that Sunday school classes, small groups, and individuals may provide feedback. Question was also raised about the Normal ’89 decision regarding war taxes. Board members noted a lack of clarity on what the decision meant. Slightly more than half the delegates had agreed that churchwide agencies need not withhold the military portion of taxes for employees who request this. Moderator George Brunk Ⅲ noted the decision is valid but that it can be reconsidered following a churchwide study on war taxes currently underway. To confess our own complicity and selfishness in utilizing more than our share of the world’s supply of oil and other resources and for our limited concern for long-standing injustices in the Middle East, and also to confess and reexamine our complicity in paying for the military buildup through our taxes. They focused on the question of withholding war taxes for their employees. Two years ago delegates to Mennonite General Assembly had authorized churchwide boards to honor requests of employees not to withhold the military portion of their income taxes; final decision was up to each board. Though it had been previously discussed in several meetings, General Board had made no decision on the issue. Nor did it come easy this time. Board members raised questions about their financial liability. They acknowledged the burden of leadership: other churchwide boards were awaiting the General Board decision for help with their own. There was also plenty of content around this time that wasn’t directly prompted by the Mennonite Church board’s inaction. While paying taxes may be an economic burden to some, may be a question of conscience to others, and may be an accounting nightmare for many more, I willingly pay my taxes. Why? It is a matter of submission. I am called to not only submit to God and to submit to my church leaders but also to submit to my civil authorities. The only time that I can refuse to obey the governing authority is when God’s law requires me to do otherwise. For me the payment of taxes is not so much an attempt to avoid penalties, court orders, or imprisonment but it is a matter of Christian conscience. I consider firstfruits tithing to be an important dimension of Christian living. However, should I render unto God the things that are God’s by tithing through my local church but fail to render to Caesar that which belongs to Caesar by paying my taxes, only one part of Jesus’ instruction would be fulfilled. To be a person of integrity requires me to both practice firstfruits tithing and to pay my taxes. It is a matter of honesty. To steal is to take that which belongs to someone. The Israelites were told by the prophet Malachi that they had robbed God. The problem was not a pilfering of the temple storehouse, but rather a withholding of tithes and offerings. To keep back a portion of tax dollars that the Internal Revenue Service determines are due to my government would, in my opinion, be a form of stealing. To be a person of honesty requires me to pay my taxes in full. It is a matter of credibility. Admittedly, I have concern about some aspects of the federal budget. Reports of mismanagement, fraud, and excessive deficit spending are certainly not consistent with my understanding of fiscal responsibility. However, should I withhold a portion of my taxes as a means of protest when the Scripture specifically calls for the payment of such would be to lose my credibility and Christian witness. To have credibility in a world of many critics of the gospel, I must be careful to “do good” — in this case, to pay my taxes in full. In response to “Why I Willingly Pay My Taxes”…, I feel I must prayerfully challenge the author’s unquestioning willingness to pay all taxes while he in no way addresses the tax issue as it pertains to the military budget. In fact, the author’s own reasons for paying taxes are some of the same reasons I can no longer pay the portion of tax that finances the war machine. The first point being a matter of submission, the author concludes that the only time he can refuse to obey the governing authority is when God’s law requires him to do otherwise. The law of God is that we love God with all our heart, soul, and mind, and love our neighbor as ourselves. How can I love my neighbor if I willingly pay for his murder? Hitler was able to do as much evil as he did because so many Christians submitted to human authority rather than God’s authority. Second, it is a matter of conscience. I willingly and conscientiously give taxes, customs, fear, and honor to whom they are due (Rom. 14:5–7), but only as I can do so with a clear conscience before God. To willingly contribute to a system of oppression and murder under any nation’s flag is in conflict with what God calls me to do. Third, it is a matter of integrity. To say that our firstfruits tithing goes to God and our taxes go to Caesar is to miss the point of what Jesus says in Matthew 22:17–21. Such an understanding puts God and Caesar on equal footing as though each is due equal allegiance. To be a person of integrity, I must offer all I have to God first, including my awareness of how my tax dollars are spent. I cannot with integrity refuse to bodily take part in killing another human made in God’s image, but be willing to pay someone else to do so. Fourth, it is a matter of honesty. I don’t believe that refusing to pay for war is stealing from the government. Indeed, we pay for war by stealing from the poor. We have the choice to either help bring hope of a better life to our neighbors with needed services, housing, and education or take part in their oppression by buying weapons to protect us from them when they tire of watching their children starve to death. Fifth, it is a matter of credibility. The author pays all taxes because he wishes not to lose his credibility and Christian witness. Of what and to whom are we witnesses? Are we credible witnesses to Jesus’ presence in our hearts to our brothers and sisters in Central America, such as the priests and church workers in El Salvador who were murdered by death squads trained and armed by our tax dollars? I might be willing to pay all my taxes if Congress passes the Peace Tax Fund bill which would allow those who are conscientious objectors to have their taxes used for nonmilitary purposes. But until that opportunity is available, I will no longer pay war taxes, but instead will put that money to use where it will nurture life and not poison it. ―Karl R. Yoder, Americus, Ga.
Adam R. Martin and Ervin Miller also chimed in, largely agreeing with Wengerd. Mennonite Central Committee U.S. Peace Section is inviting contributions for the 1990 Taxes for Peace Fund. The fund, established in 1972 , gives people who want to withhold war taxes a way to contribute their money toward peaceful purposes. While contributing to this fund is a symbolic action and not a legal alternative to paying the tax, many people have found it a meaningful way to demonstrate their commitment to peace. Last year, $5,750 in Taxes for Peace money was divided between the National Campaign for a Peace Tax Fund and Christian Peacemaker Teams. This year’s contributions will be divided the same way. The National Campaign for a Peace Tax Fund seeks to enact the U.S. Peace Tax Fund Bill, which would give those conscientiously opposed to war a way to pay 100 percent of their taxes by designating the military percentage to a separate fund for peace-enhancing programs. Christian Peacemaker Teams is an initiative of North American Mennonite and related churches to develop and support more assertive peacemaking. Since 1977 MCC constituents have contributed more than $75,000 to the Taxes for Peace Fund. Among other projects, the money has funded reconstruction efforts in Indochina, aided victims of violence in Guatemala, and supported the MCC U.S. Peace Section. An information packet on military-tax opposition is available for $3 from MCC U.S. Peace Section. It contains varying theological positions on the war-tax issue and materials about tax laws and legal concerns for the tax resister. Updated materials are available for those who purchased earlier editions of the packet. The 20 February 1990 issue announced a “Standing Up for Peace” contest in which young people (ages 15–23) “are urged to interview someone who has refused to fight in war, pay war taxes, or build weapons and then write an essay or song, produce a video, or create a work of art.” The MCC (U.S.) Peace Section was one of the sponsors. St. Louis (Mo.) Mennonite Fellowship has decided to stop paying its telephone tax as a form of protest against military spending. Federal phone tax revenues, first collected in 1941 , contribute directly to the U.S. Armed Forces. “Though the biblical basis for such action has been debated, we wish to respect the convictions of our members and Anabaptist forebears and foremostly to be disciplined followers of Jesus Christ,” said Scott Neufeld, who coordinates the congregation’s peace witness. The congregation will send its tax money instead to Mennonite Central Committee. The 1 May 1990 issue included an article on Mennonite martyrs of the World War Ⅰ period who were persecuted for refusing to buy war bonds (see ♇ 1 September 2018 for that article). The issue of military tax withholding for MBCM employees was discussed at length. However, no action was taken. Since no MBCM employees are currently requesting that the military portion of their taxes not be withheld, the board agreed to wait for such a request before responding to the military tax withholding question. In November J. Lorne Peachey took over from Daniel Hertzler as editor. We haven’t heard from Peachey yet so I don’t know if he took any position in the war tax resistance debates that might influence his editorial positions. A 11 December 1990 letter to the editor from John F. Murray used the war tax resistance issue as a rhetorical hook in the course of trying to prompt readers into tithing more to the Church. A Philadelphia Quaker organization must garnish the wages of its employees who fail to pay income tax for religious reasons, a federal judge in Philadelphia ruled. But Judge Norma Shapiro also said the Philadelphia Yearly Meeting of the Religious Society of Friends cannot be penalized for failing to honor the levies imposed by the U.S. Internal Revenue Service. The case involved the refusal of three Friends employees to pay the full amount of their taxes because part of it would go to the military, and that would violate their religious antiwar beliefs. Waterloo, Ont. (Mennonite Reporter) — Two Ontario Mennonite leaders have declared their conscientious objection to the payment of military taxes. However, their employers have not yet decided whether or how to cooperate with the request to redirect military taxes for peaceful purposes. 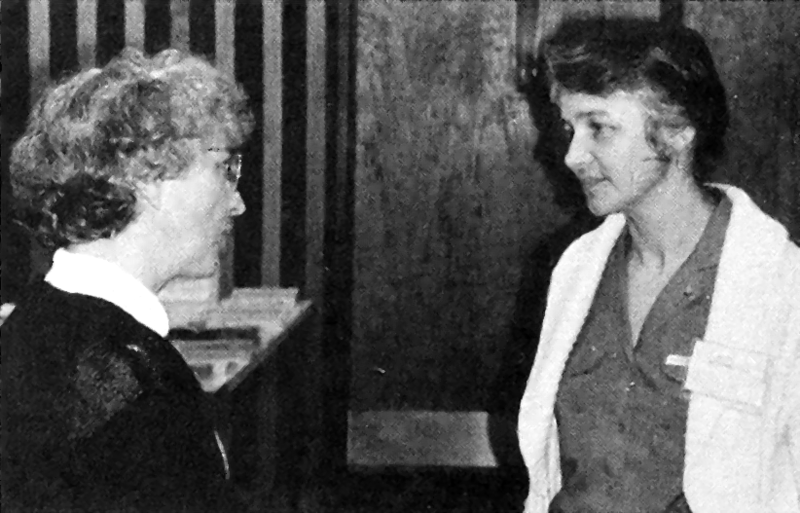 Fred Martin, the student and young adult minister for Eastern Canada Conference, first raised the issue in the fall of 1989 . Jean-Jacques Goulet, pastor of Wilmot Mennonite Church, took a similar stand the week that the Persian Gulf War started. His church is waiting to see how the conference will resolve the matter. Last October , at its fall delegate meeting, the conference gave notice of a recommendation that will be dealt with at the annual meeting next month . That recommendation called on the conference to support Martin not forwarding to Revenue Canada the portion of his income tax used for military purposes. Since the October meeting, the executive board of the conference has looked more closely at how to proceed if the fall recommendation is accepted. The board has prepared an alternative resolution, calling on the conference: (1) to “withhold no income tax from the salary of any conference employee who requests this on the basis of conscience”; (2) to inform Revenue Canada and members of Parliament of the decision; (3) to ask the government to introduce legislation recognizing conscientious objection to payment of military taxes and to provide peaceful alternatives for use of these tax dollars; and (4) to support other church boards, agencies, and congregations that may adopt similar policies. Eastern Canada Conference, however, is proposing to treat military tax objectors as full employees, and to continue all regular benefits and deductions, except for income tax deductions. It would be left to the employee to remit income taxes to Revenue Canada after redirecting the military portion. This procedure has been used by the General Conference Mennonite Church after that denomination decided in 1983 to support military tax objectors. The Mennonite Church has made a similar commitment in principle, but has not yet decided on a procedure to use. According to Steiner, the conference would technically be Hable for breaking tax laws by deciding not to collect income taxes for the government. Baden, Ont. (Mennonite Reporter) — After a vigorous debate, delegates to the annual meeting of Eastern Canada Conference, Apr. 5–7 , defeated a proposal calling on the conference not to deduct income tax from employees who want to redirect the military portion for peaceful purposes. They also tabled an alternative resolution. The conference executive board developed its proposal in response to a request from its student and young adult minister, Fred Martin. He indicated in the fall of 1989 that he objected on the basis of conscience to paying military taxes. He asked the conference — which is required by law to deduct all income taxes and remit them to Revenue Canada — to help him find a way to express his conscience. In introducing the proposal, conference secretary Sam Steiner said the executive board had not been unanimous. Some abstained from voting; others were against the proposal. He also said the proposed action could make the conference legally liable for breaking the Income Tax Act. The legal question dominated the Saturday afternoon discussion by delegates. For example. Ken Musselman said military tax objectors should use other options, like increasing charitable donations or cutting back their overall income to reduce taxes. A number of delegates said that individuals who want to redirect military taxes should assume the legal liability themselves — for example, as contract employees — rather than expect conference to bear it. Others supported the proposal. They cited historical precedents such as World War Ⅰ conscientious objectors choosing jail rather than the military uniform. A number who lined up at the open mikes said they liked the second part of the executive board’s proposal — to seek legislation recognizing conscientious objections to payment of military taxes — but objected to the first part — asking conference to defy current income tax laws. The delegates then faced two choices: either table the executive board’s proposal or look at an alternative resolution. The alternative, presented by Margot Fieguth, began with the second part of the original proposal: an attempt to work through legislative and legal avenues to secure recognition of conscientious objection to payment of military taxes and to provide peaceful alternatives. This resolution also suggested that conference offer Fred Martin a contract position, so that he, rather than conference, would be responsible to make income tax payments. Delegates decided not to table the original proposal. But before they started debating the alternative, there were voices calling for a vote on the executive board’s proposal. “I would like to hear the truth of where the conference stands on this issue,” said Jean-Jacques Goulet, pastor of Wilmot (Ont.) Mennonite Church. During the Gulf War he had declared himself a conscientious objector to military taxes. And his congregation was waiting to see how conference would respond to Fred Martin. In a ballot vote, the executive board’s proposal was defeated 159-48. It was late in the evening. The alternative resolution was on the floor. But someone proposed that it be tabled till the next session of conference. The motion carried. Another General Assembly was held around the beginning of August , and I’m sure the board of directors were on tenterhooks hoping that the Assembly would let them off the hook about implementing the decision they’d made at the previous General Assembly to begin refusing to withhold war taxes from the salaries of objecting employees. Unfortunately, I see nothing in the Gospel Herald coverage that indicates that issue was addressed at all. Instead, there was a lot of talk about encouraging Mennonites to contribute more to the Peace Tax Fund lobbying effort. Delegates did look to themselves in reconsidering a 1989 statement on the Peace Tax Fund. The statement had called on individual Mennonites to contribute to this fund. Noting that less than one percent had done so, this time delegates took action to urge conferences and congregations to put the Peace Tax Fund in their budgets. The Peace Tax Fund would allow conscientious objectors to pay their taxes by diverting the military portion to a special trust fund. Efforts are currently underway to have the Fund be considered by lawmakers in the U.S.; a comparable campaign is also being considered in Canada. Weldon and Marg Nisly of Cincinnati told how they are refusing to pay the portion of their taxes that goes to the military. The Internal Revenue Service has frozen their bank accounts and life for them has become more inconvenient, but Nisleys said this is one way for them to “say no to the military monster.” Their call for 100,000 other Mennonites to join them was met with applause. 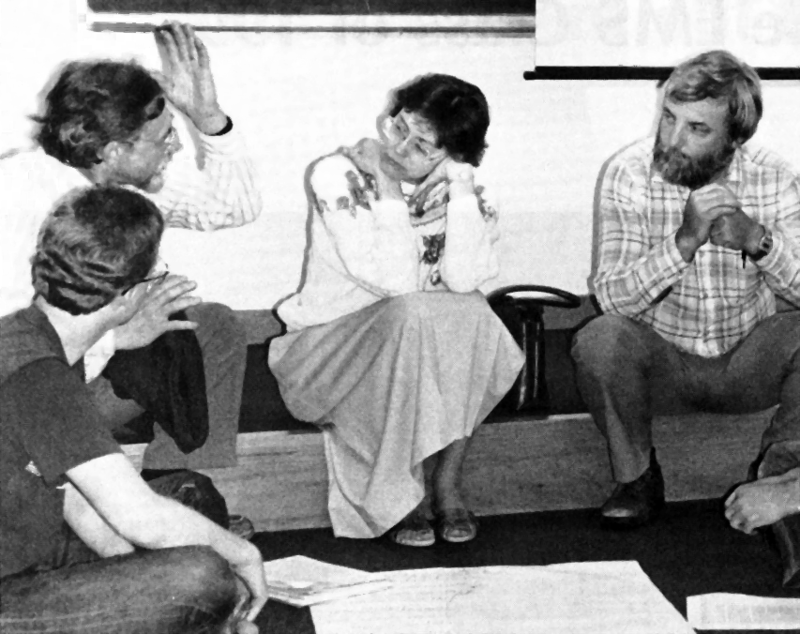 In 1989 Mennonite General Assembly went on record to encourage individuals to contribute to a peace tax fund campaign. Less than one percent of us did. So in Oregon delegates made their action stronger: they are now “urging” district conferences and local congregations to put the peace tax fund into their annual budgets. So your congregation will need to make a decision about that “urging” some time in the next two years. Will you give expression to your belief in peace by supporting a congregational budget item to contribute to a peace tax fund? The contribution will be used to help sponsor legislation in both Washington and Ottawa to legitimatize a peace tax fund as an option for persons opposed to having their tax money used for military purposes. Some Seniors for Peace withhold the military portion of their income taxes and contribute it to a peace fund. Many actively support lobbying for legislation for a peace tax fund to provide alternative service for tax dollars. And finally, a 29 October 1991 letter to the editor from Tim Nafziger urged Mennonites not to stop, satisfied by redirecting their taxes to a peace tax fund. “The Mennonite Church is called to do more than be morally pure,” he wrote.